It's hard to believe that it was over a century and a half ago that Charles Dickens penned his classic novella, "A Highsec Christmas Carol". Even more impressive is how relevant the themes he wrote about remain today. Arguably, the tale makes even more sense to a modern audience: Now that EVE Online exists, the references in the tale to EVE and its game mechanics carry some meaning. They mystified earlier readers. It has become a tradition for many publications to print "A Highsec Christmas Carol" during the holiday season. MinerBumping certainly fits the description of a "publication", so it seems appropriate for us to do the same. Gather your family and enjoy this timeless, heart-warming story. Marley quit EVE, to begin with. There is no doubt whatever about that. He didn't "quit" the way some do, keeping their assets and still logging in occasionally to update their skill queues. Marley really quit. He biomassed all of his characters and gave away all of his possessions. Scrooge knew Marley quit. Of course he did. How could it be otherwise? Scrooge and Marley had been partners in a highsec mining corp for years. When Marley told Scrooge he planned to quit, Scrooge asked if he could have his stuff. Marley didn't know anyone else to give it to, so he granted Scrooge's request. No one else noticed that Marley left the game, and even Scrooge was not so dreadfully cut up by the sad event. Accepting the contract for all of Marley's assets, Scrooge's isk/hr ratio was improved for the day. This brings me back to the point I started from. There is no doubt that Marley quit EVE. This must be distinctly understood, or nothing wonderful can come of the story I am going to relate. Scrooge continued the mining business. He never removed the "Marley" from the corp name, since there's no mechanic for renaming corps. He did invite new carebears into the corp, though. The more members, the more taxes Scrooge collected. And that was the only reason he bothered. Oh! But he was a tight-fisted hand at the grindstone, Scrooge. A squeezing, wrenching, grasping, scraping, clutching, covetous old sinner! Hard and sharp as flint, from which no steel had ever struck out generous fire; secret, and self-contained, and solitary as an oyster. Making isk was the only thing he liked. Edging his way along the crowded paths of life, warning all human sympathy to keep its distance, he carried his own low temperature always about with him. And it didn't thaw one degree at Christmas. One Christmas Eve, old Scrooge camped out in an ice anomaly, ordering his corp members to haul around his freshly-mined ice. "Merry Christmas!" cried a voice in local. It was Scrooge's nephew, Fred. "Christmas a strawberry, Uncle!" said Scrooge's nephew. "You don't mean that, I am sure?" But he did. Scrooge hated Christmas. It was little more than an excuse for his corp members to refuse to log in and help him move around space rocks one day each year. "What do you want, Fred?" Scrooge asked. "I came to invite you for Christmas dinner," said Scrooge's nephew. "Also, I'm selling mining permits for 10 million isk." "Bah! Strawberry!" Scrooge ordered his corp members to remain silent until Agent Fred left the system. They did. Afterward, one of the hauling vessels, piloted by a gentleman named Bob Cratchit, inquired if it would be possible to be paid a Christmas bonus of 10 million isk. "It's not for me," Cratchit explained. "It's for my son, Tiny Tim. He doesn't have a mining permit and I'm concerned for his safety." Scrooge refused. "If he wants 10 million isk, he can earn it for himself. Are there no Level 1 missions? And the asteroid belts--aren't they still respawning in 1.0 systems?" "He's just a 12-year-old who lives in his mother's basement. Why should I part with any of my own hard-earned isk for his sake? It's not my business. It's enough for a man to understand his own business, and not to interfere with other people's. Mine occupies me constantly. Now then, back to work!" As Scrooge was settling in for the night, he heard an ominous sound. A disturbing, humming sound. It reminded him of the dull sound of a mining laser. Suddenly, a shocking sight appeared in front of him. It was the face of Jacob Marley! Scrooge couldn't believe it. "What do you want with me?" asked Scrooge. "Much. Ask me who I was," said the man. "Who were you then?" said Scrooge, raising his voice. "When I played EVE, I was your partner, Jacob Marley." So it was that Ebenezer Scrooge encountered a ghost. Jacob Marley had indeed quit EVE, but he remained bound by the torment of his eternal regrets. His was a wasted EVE career. He did nothing and left nothing behind. There was no one to mourn him, save Scrooge himself. But even Scrooge had been too busy counting his isk to care. He cared for nothing else, just like Marley had until the day he quit EVE. "I am here tonight to warn you, that you have yet a chance and hope of escaping my fate," said Marley. "You will be haunted by three Spirits. Pay heed, Scrooge!" Scrooge trembled. Marley faded from view, the echoes of a mining laser becoming ever more faint. Scrooge was unable to sleep. Just as his eyes were growing heavy, they snapped open at the sight of another unnatural vision. "I am the Agent of Christmas Past." "Why have you come, Spirit?" "For your welfare!" said the Ghost. "I have come to teach you about the Code." Scrooge frowned. "Not interested," he said. "How can you say such a thing, without having first learned what the Code is?" asked the Ghost. "Fine then," said Scrooge. "What is it?" "Much and more," answered the Ghost. "To begin with, you must purchase a mining permit for 10 million isk." "It's not much. You have the money to spare, Scrooge." "I won't pay it. It's about the principle of the thing. Mining is free in highsec!" "Scrooge, it is time for you to learn of your obligations under the Code, and of the spirit of Christmas. Behold!" Before Scrooge could say anything, he found himself standing beside the Ghost upon an open country road, with fields on either hand. "Good Heaven!" said Scrooge, "I was bred in this place. I was a boy here!" The Ghost nodded. Suddenly Scrooge realized that he had been transported across time and space. "This is an exploit! Return me to my home at once!" "Observe the fields. They are not quite deserted. A solitary child, neglected by his friends, is left there still." Scrooge said he knew it, and he sobbed. He saw himself as a lonely young boy, picking strawberries in the fields. "I was made to pick the strawberries," Scrooge said. "All the other lads played their games after school, but I was left to myself. Poor boy. But at least I made some money for it." "Yes, Scrooge, you did. The rest of the children enjoyed games and each other's company, while you learned to spend your time slowly making money through monotonous, repetitive gathering." Scrooge squinted at the Ghost, annoyed. "I found it relaxing." The Ghost smiled thoughtfully. He waved his hand, saying, "Let us see another Christmas!" Once again the setting changed. This time, Scrooge and the Ghost appeared a short distance behind a man and a woman. It was late evening, and the moon shone brightly in the sky. "Yes," said the Ghost. "You see yourself as you were, a young man. Sharing a rare evening with Belle, away from your mining." Scrooge became silent and watched his former self. The young Scrooge happily listened to the young lady singing a song to the moon. The Ghost leaned toward the elder Scrooge and spoke. "You did not marry her, did you?" Scrooge, startled as if woken from a trance, sputtered, "N-no. I did not." "Shall we see why not?" asked the Ghost. "Spirit!" said Scrooge. "Show me no more! Conduct me home." "No more!" cried Scrooge. "Why do you delight to torture me? No more, I don't wish to see it. Show me no more!" "This is harassment!" exclaimed Scrooge. "I already told you to stop. If you don't stop, that makes it harassment!" But the relentless Ghost transported them both to another scene and place. They saw the young woman again, a year older. But the young Scrooge was nowhere to be found. The woman began to sob. So too did the old Scrooge, watching alongside the Ghost. "She was trying to convo you," said the Ghost. "But you didn't answer, did you?" Scrooge, his eyes cast to the ground, shook his head. In a very soft voice, he whispered, "I was AFK." "I see. And why would you do such a thing?" Scrooge shrugged. "It could be that I was helping a friend fix his plumbing. Or possibly I was getting a drink or making dinner. Or playing with my cat. I might've been taking care of my child. Whatever it was, I had a legitimate reason to go AFK." "Actually," the Ghost corrected him, "You don't own a cat, and you don't have any children. And you certainly never helped anyone but yourself." "No, on this occasion you decided to go AFK so you could use the bathroom." Scrooge's eyebrows furrowed. "What of it?" "You never asked an Agent's permission, did you? If you had, perhaps the Agent could have looked after your affairs while you were away." "Bah!" Scrooge yelled. "Str--" he stopped himself. "I don't need anyone's permission to use the bathroom. I have no use for your Agents, or for your wretched Code!" "The truth is, you always found some reason to be AFK, Scrooge. You would return to reset your mining lasers and make some more money, but you never had time for the people. No time for Belle." Scrooge snarled. "I have powerful friends in the local constabulary. If you don't return me home this instant, I'm opening a support ticket." "Aren't you curious what happened to Belle? After she left you, I mean." Scrooge paused. "She took up with some isk-doubler in Jita, I believe." The Ghost nodded. "That she did." A long silence followed. Finally, Scrooge asked, "Did he make her happy?" "He did at first, but then he made her very unhappy." When exactly the Ghost left Scrooge, he couldn't say. His memory became hazy, until he awoke with a start. He was back in his own bedroom. He was relieved at first, but then he remembered Jacob Marley's words. There were two more Spirits yet to visit him that night. The hours ticked by. "Perhaps they won't come," said Scrooge. "Maybe they've been banned." No sooner had Scrooge uttered these words than he caught a glimpse of an unnatural light shining in the corner of his eye. Scrooge turned around timidly. "I am the Agent of Christmas Present," said the Spirit. "Look upon me!" Scrooge saw the Ghost, a rotund, jolly figure. "What do you want?" Scrooge asked. "I have come to teach you about the Christmas spirit," said the Ghost, "And to assist you in obeying the New Halaima Code of Conduct." Scrooge gritted his teeth. "I already told the other Spirit that I won't pay for a mining permit." "Not yet, maybe," said the Ghost. "Not ever. I would rather quit mining altogether than pay." "That's why I need to show you visions of Christmas Present, to make you a better person. Then you will pay." "More visions!" Scrooge hollered. "This is extortion!" "Relax, good sir," said the Ghost, "I'm not in the business of extorting people. This is your chance to undertake a journey of self-discovery!" "Extortion, you mean," said Scrooge, leaping to his bookcase to find a dictionary. As he thumbed through its pages to look up the definition of the word "extortion" so he could read it to the Ghost, everything vanished. The Ghost had transported the both of them to another place. "Watch your language," the Ghost admonished him. "There are children present." Scrooge looked about. He saw a dinner table surrounded by a joyous family. He recognized the patriarch of the family. It was Bob Cratchit, the hauler pilot who worked for his corp.
"As you can see," said the Ghost, "This family is able to experience the joy of Christmas, even with what little money they have. But I wonder what they think of you, the man who puts such a high tax rate on the corp?" "Enough!" shouted Scrooge. "You think I don't know what you're doing? You're going to show me a vision of my employee's family trash-talking me. I've already seen three visions. Now you show me a fourth. One vision, fine. But this goes on and on, and you're only the second Spirit out of three who intend to haunt me tonight. This is nothing more than harassment. And I don't have to take it." Scrooge folded his arms and turned away from the Ghost and the Cratchit family. "Are you finished?" asked the Ghost. "No!" Scrooge snarled, spinning around to face the Spirit again. "I know what you are. You are a bully. You and the first Spirit, and I'll wager the third, as well. You're all bullies." "A bully?" asked the Ghost. "I'm your spiritual mentor." "I don't care how you dress it up. You go on about how you're teaching me about Christmas and being a better person. The fact of the matter is, you just enjoy griefing people. You're sick. A sociopath. And a belligerent undesirable, to boot." The Cratchit family, unaware of the argument that was taking place behind them, continued to enjoy their meal. Mrs. Cratchit could be heard criticizing Scrooge for not paying her husband enough, and for placing too high a tax rate on the corp.
"I knew it!" Scrooge roared. "You torment me with these visions. What gives you the right? Who are you to judge me, and to tell me I need to become a better person? You don't pay for my subscription. You don't hold sovereignty here; you shouldn't even be here. You are a Spirit. This is the land of the living. If you want to torment some poor old soul, go to the underworld, where apparitions such as you belong!" The Ghost stared back at Scrooge with raised eyebrows, but did not speak. He moved his gaze across the room. Scrooge turned his head to see what had caught the Ghost's attention. It was Tiny Tim. He slowly walked into the room to join the rest of the family at the dinner table. As Scrooge knew, Tiny Tim did not have a mining permit. And this clearly made Tiny Tim miserable. "I wish you wouldn't send little Timmy out there to mine without a permit," said Mrs. Cratchit to her husband. But she knew they had not the money. Scrooge didn't pay enough, and the tax rate was too high. Scrooge was about to say "extortion" or "scam", but the words would not leave his mouth. For a moment, he felt compassion, an interest in his fellow man that he had not felt before. "Spirit," said Scrooge, "Tell me if Tiny Tim will live." "I see a vacant seat," replied the Ghost, "If these shadows remain unaltered by the future, the child will die. Ganked for mining without a license." "No, no," said Scrooge. "Spirit! Say he will be spared." "New players are under no less obligation to follow the Code than anyone else." Scrooge grimaced. He did not know what to say. He could only watch Tiny Tim with his family and think of the heartache they would experience when they learned of his death. "Of course, there is an alternative," said the Ghost, "If you gave me 10 million isk for Tiny Tim's permit, I could see that it gets to the right people." Scrooge looked at the Ghost uncertainly. "And while we're at it," the Ghost added, "I'm sure there are other members of the Cratchit family who would benefit from the gift of a New Order permit. Perhaps you could purchase some shares, as well." Scrooge thought of the money. "No," said Scrooge, shaking his head, "No, no, no..." His voice grew louder. "I won't pay it!" he shouted. "The isk is mine, I earned it!" "And what good has it done you?" the Ghost demanded. "That's none of your business! I wish to be left alone, Spirit! This is a sandbox. If I want to make a lot of money and do nothing with it, that's my choice. I will not let anyone else tell me what to do. I will not yield to the demands of scammers, extortionists, bullies, and griefers!" "You will pay. You will obey the Code," said the Ghost. "Then it is time for you to see another vision." "No!" Scrooge shrieked. "You can't make me!" But in the twinkling of an eye, Scrooge yet again found himself in another place, a witness to another vision. "They said you could play this game however you wanted," Scrooge sobbed, "They lied." After Scrooge wiped away his tears, the Ghost patted him on the shoulder. "Do you know what place this is?" the Ghost asked. "Of course," said Scrooge, still sniffling, "A place where miners live, labouring in the bowels of the asteroid belts." "Indeed. These are your miners, the miners of your own corp."
"Why have you brought me here, Spirit?" Scrooge was suspicious. "Surely you can't mean to torment me with a vision of a belt being mined. I see sights such as these every day." "I wonder what your corp members really think of you?" the Ghost hinted. Already they could overhear the miners complaining about Scrooge and the corp tax rate. "The taxes again? Bah! I earn every isk of it. I give my corp the benefits of my leadership. That's value added." "Leadership in a highsec mining corp?" the Ghost smiled. "As if miners need to be told to mine." "We have an Orca pilot," Scrooge retorted. "Yes," said the Ghost. "I'm adding him to my contacts list. He's anti-tanked." The miners' complaints continued. Scrooge winced to hear them. A miner piped up, "Scrooge says we can't fight back when we get wardecc'ed. 'Stay docked up for the week and they'll get bored and go away,' he says. Well, what if we're the ones who get bored? What if we go away?" Murmurs of approval echoed throughout. Someone joked about awoxing Scrooge. "Cease your idle prattling!" Scrooge hollered across the belt. "You don't know anything about running a corp!" "He can't hear you," the Ghost said. "No, they all just went AFK again. Like you taught them. Yet it seems you are not the beloved CEO you thought you were." Scrooge smirked. "I don't care what you do to me, Spirit," he growled. "Because you know what? As long as you're haunting me, you're not haunting anyone else. I win." The Ghost looked at him, expressionless. "I'm keeping you from bothering the rest of my corp," Scrooge put on a false smile. "I'm a hero to them." "Your corpmates aren't aware of any of this," replied the Ghost. "Nor would they care if they were. They don't care about you. They only care about getting more and more isk. Another lesson they learned from their CEO." Scrooge couldn't hold his smile any longer. He pointed to the miners. "They're violating the Code! You better go do something about that!" "I am here for you, and for you alone, Scrooge," said the Ghost. Scrooge was apoplectic. He could not speak. Panting, purple with rage, with veins bulging from his neck and sweat pouring down his face, his eyes bloodshot and welling with tears, he was quite a sight to behold. The Ghost asked, "Are you angry, Scrooge?" "Someone ought to do something about you damned Spirits." "Someone?" the Ghost inquired, "Not you?" "I don't have time to deal with Spirits," Scrooge snapped. "If I did, there wouldn't be a problem." "So someone else will handle the problem while you continue to mine." "You know," said the Ghost, gesturing toward the miners in the asteroid belt, "Every other miner here feels exactly the same way." Scrooge huffed and puffed. "I won't obey the Code," he said, "I won't. You can't make me." The Ghost scratched his chin. "I can bump you, you know." "Bumping?" Scrooge was perplexed. "That won't do anything." Without warning, the Ghost bumped into Scrooge, sending him flying end over end. A storm of profanity arose from Scrooge's mouth, the likes of which has scarcely been heard before or since. Ebenezer Scrooge rage-quit and went AFK for the duration of this stave. Scrooge awoke in his bedroom. He was shaking, trembling. He was alone for now--but all too aware that he would soon be haunted by the third and final Ghost. He was too anxious to climb into bed and try to sleep, yet too exhausted to keep his eyes entirely open. His eyelids drooped as he sat upright in his chair. Time passed. Too much time. "I've seen the last of the Spirits this night," Scrooge told himself. "Three Spirits, yes, but old Marley counted as the first one, I think." Regardless, he promised himself he would file a petition first thing in the morning. A red light flickered, faintly, across the room. Scrooge hardly took notice of it until it blinked a second time, and a third. A slow, steady blinking continued. Then Scrooge saw it. The Ghost slowly, gravely, silently approached. In the very air through which this Ghost moved, it seemed to scatter gloom and mystery. It was shrouded in a deep, dark red garment, which concealed its head, its face, its form, and left nothing of it visible save one outstretched, bony hand. A red light burned from within, pulsing, piercing the darkness of the night. The Ghost had the appearance of the Grim Reaper, and filled Scrooge with solemn dread. The Ghost neither spoke nor moved. "I am in the presence of the Agent of Christmas Yet To Come?" asked Scrooge. The Ghost answered not, but pointed onward with its hand. "You are about to show me shadows of the things that have not yet happened, but will happen in the time before us," Scrooge pursued. "Is that so, Spirit?" Scrooge believed he caught sight of a barely perceptible nod. "Agent of the Future!" Scrooge exclaimed. "I fear you more than any spectre I have seen. But if you intend to kill me, you must first speak to me to see if I am AFK. That is in your Code, is it not?" It gave no reply. The hand was pointed straight before them. "Lead on," said Scrooge. "Lead on, Spirit!" The Ghost glided across the room, and Scrooge found himself caught up in the shadow until a new scene appeared. Scrooge looked to and fro. It was a busy place, with many people going this way and that. It took some time for Scrooge to recognize where he was. When he finally did, he was stunned. "This is the headquarters of Scrooge & Marley Corp!" he marveled. It was much busier than it had ever been in Scrooge's memory. It was filled with happy, contented EVE players. Excited at first, a disturbing thought began to take root in Scrooge's mind. He couldn't find any sign of the names "Scrooge" or "Marley". The more he looked, the more it dawned on him that he couldn't find a trace of himself, or Marley, anywhere. "It's as if I was never here," he pondered. The Ghost glided to a stop beside one little knot of businessmen. Scrooge advanced to listen to their talk. They were discussing the Code and the New Order, and how much progress had been made in highsec over the past several years. Scrooge gritted his teeth. Only then did he notice that everyone he saw was carrying a New Order permit. "Surely there must be some evidence that I existed, Spirit," Scrooge said to the Ghost. "The New Order succeeded, fine. I don't begrudge them, as long as I have a legacy of my own." Quiet and dark but for the blinking red light, beside him stood the Ghost, with its outstretched hand. It began to move. Scrooge followed, desperate yet deeply afraid. They entered a cemetary. As they advanced, Scrooge could hear the whispers of voices, speaking of the dead. "He couldn't take it anymore," whispered a voice, "The ganking, the wardecs, the bumps, the awoxing. He biomassed everything. Didn't give anything away. Just let all of that money accumulated over the years evaporate, disappear." The Ghost stood among the graves, and pointed down to one. Scrooge walked toward it, trembling. "Before I draw nearer to that stone to which you point," said Scrooge, "Answer me one question. Are these shadows of the things that will be, or are they shadows of things that may be, only?" The Ghost was immovable as ever. Scrooge crept toward the stone, trembling as he went. And following the finger, read upon the stone of the neglected grave his own name, Ebenezer Scrooge. "No, Spirit! Oh no, no!" Scrooge dared to grasp the Ghost's hand. "Good Spirit, assure me that I yet may change these shadows you have shown me, by an altered life? I will honour Christmas in my heart, and try to keep it all the year. I will live in the Past, the Present, and the Future. The Spirits of all Three shall strive within me. I will not shut out the lessons that they teach. Oh, tell me I may sponge away the writing on this stone!" Scrooge awoke with a start, his heart pounding. He looked around. Just as suddenly as he awoke, he bolted to his closet and began dressing himself. Laughing and crying in the same breath, he ran outside into the street. "I am light as a feather, I am as merry as a schoolboy. I am as giddy as a drunken man. A merry Christmas to everybody! A happy New Year to all the world! Hallo here! Whoop! Hallo!" Really, for a man who had been out of practice for so many years, it was a splendid laugh, a most illustrious laugh. The father of a long, long line of brilliant laughs! "What's today?" cried Scrooge, calling down the street to a boy. The boy didn't answer. He was AFK. Scrooge continued running down the street until he came across a boy with a New Order permit. Surely he would answer. "What's today, my fine fellow?" said Scrooge. "Today?" replied the boy. "Why, it's Christmas Day, of course." "Do you know the Caldari Navy Assembly Plant, the one at Jita Planet 4, Moon 4?" Scrooge inquired. "An intelligent boy!" said Scrooge. "A remarkable boy! Do you know whether they've sold the prize Catalyst that was for sale there? Not one of the little, ordinary Catalysts, but the InterBus one?" "What a delightful boy!" said Scrooge. "It's a pleasure to talk to him. Yes, that one!" "It's still got a Sell Order up now," replied the boy. "Has it?" said Scrooge. "Go and buy it." "No, no," said Scrooge, "I am in earnest. Go and buy it, and contract it to me, and I'll tell Red Frog Freight where to take it." The boy took Scrooge's money and was off like a shot. "I'll send it to my nephew, Agent Fred," whispered Scrooge, rubbing his hands, and splitting with a laugh. "He shan't know who sends it. He could take out two Retrievers in one gank, if he's lucky!" Actually, the young boy would keep the isk for himself. Scrooge spent the rest of the morning handing out money to passersby in units of 10 million isk. "Buy yourself a permit!" said Scrooge. "Get Code-compliant and reap the blessings!" In a morning of giving money away, Scrooge felt more alive than in all his years of saving money for himself. He had never dreamt that charity and the Code could give him so much happiness. As noon approached, Scrooge found himself at the door of the home of Bob Cratchit, his employee. Cratchit was flabbergasted when he opened the door. "Scrooge! Sir, I, I'm very sorry, sir. My wife wouldn't let me do any hauling today." "It's only once a year, sir," pleaded Cratchit, "It shall not be repeated. I was making rather merry yesterday, sir." "Now, I'll tell you what, my friend," said Scrooge, "I am not going to stand this sort of thing any longer. And therefore," he continued, "and therefore I am about to raise your salary!" Bob trembled. What was the meaning of this? "A merry Christmas, Bob!" said Scrooge, with an earnestness that could not be mistaken, as he clapped him on the back. "A merrier Christmas, Bob, my good fellow, than I have given you for many a year! I'll raise your salary, and endeavour to assist your struggling family, and we will discuss your affairs this very afternoon." Scrooge was better than his word. He did it all, and infinitely more; and to Tiny Tim, he was a second father. 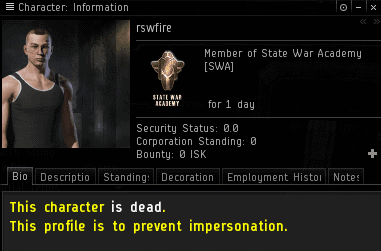 He became as good a friend, as good a CEO, and as good a man, as EVE Online ever knew. Some people laughed to see the alteration in him, but he let them laugh, and little heeded them; for he was wise enough to know that nothing ever happened in EVE, for good, at which some people did not have their fill of laughter in the outset. His own heart laughed, and that was quite enough for him. As Scrooge walked with Cratchit into the Cratchit home, he came across Tiny Tim. Scrooge knelt down, reached into his pocket, and produced 10 million isk. From that point forward, Tiny Tim would be a legal miner, and would never again have cause to fear being ganked. Tiny Tim squealed with delight. "Long live the New Order and its Code," he said, "And all hail James 315, the Saviour of Highsec!" A staggering riot of a piece; should be read by the whole EVE Community. James 315, not only do you have Dickens to a 'T', you have managed to comment in depth on the Highsec Miner/Carebear mentality and to address the problem with eloquence and grace. It is now clear beyond doubt that the New Order is the only solution the problems they present. Hail Supreme Protector of Halaima; Hail James 315, Saviour of Highsec! This, brought a tear to my eye. Bravo! i looooved this piece of art. thank you very much for this beautiful christmas present. all that new order story insiders. so very well told. Merry Christmas to all Agents, Knights, Miners, and of course to James himself. "Did he make her happy?" I cried a little at the sheer perfection of this. Ty for a good reading! Merry Christmas everyone ! You, sir.. have won the Internet for the rest of the year! Frodo disposes of The Ring, Middle Earth is saved. Also, if you ned help with your 12 times tables, PM me in game i have a cheat sheet for that. I love this. Wow. Just amazing. Perfect. I was worried that James would take the day off. Instead, we get this masterpiece. Minerbumping is the best thing to ever happen to Eve. He's truly the Savior of Highsec 365 days a year, not just the 364 convenient ones. A stawberry pie for all my new order bros. Merry Christmas! Awesome! Just very, very well done! James, you outdid yourself this time. Masterfully written - a great joy to read! LMAO at the $3500 gravestone! James 315, making me resub after two years of hiatus. Truly, you are the christmas miracle eve needs. I have to admit, I was enjoying this until rwsfire showed up. Seems like we're beating a dead horse here. The interbus catalyst line was amazing though. You don't seem to understand the process of fitting current events to a pre-existing narrative to make a satire. If there's a dead person in the pre-existing story, you use a dead thing in current events to fit. Using someone else, as you seem to be suggesting, wouldn't fit in properly. The (very quick) bit about rswfire was one of the best bits of the piece, actually, both timely and fitting the Christmas Carol so perfectly. Who would you suggest would have been better to have used instead? Merry Christmas (belated) & happy New Year everyone. "Actually, the young boy would keep the isk for himself." i had to hold the desk to keep from falling off my chair and passing out with laughter. id like to see someone try to outdo this literary marvel. Truly a masterpiece. Thank you for this James. May the New Order continue to grow and prosper for many years to come. Happy New Year. It is our propensity to re-read one of our most loved Christmas stories around Christmastime every year - resoundingly on the off chance that anybody will tune in, noiselessly if not. Frequently as not, it's A Christmas Carol, of which Emsworth never tires. Now and again it's one of Dickens' lesser Christmas stories, in some cases O. Henry's "The Gift of the Magi." This Christmas Eve, we fell cheerfully back on P.G. Wodehouse's just Christmas story, "Jeeves and the Yule-Tide Spirit."